AP DEECET/DIETCET Second Phase Seat Allotment Results List 2018: Commissioner of School Education, Government of AP has scheduled the 2nd Phase Counselling (Preparation of Seat Matrix, Submission of Web options by candidates, issue of Provisional letters of admissions, Verification of Certificates at DIETs and Issue of final admission letters) for SW-II from 26th August to 29th August. The CSE AP has done with the submission of web options by candidates from 13th August to 17th August. The seat allotment will be Released from today, 25th August. Aspirants who got the admission in 2nd phase seat allotment can check the seat allotment results from 18th August to 24th August. Candidates allotted admission can download AP DEECET Admission Letter on 25th August from the official portal, apdeecet.apcfss.in. 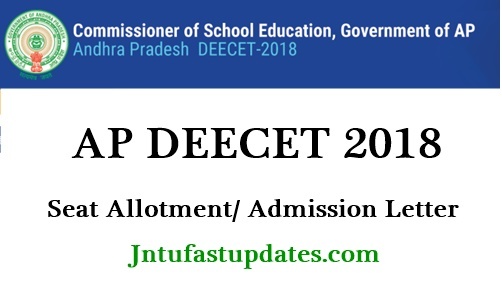 aspirants can go through the following article for more details about AP DEECET Admission Letter, 1st round and 2nd round seat allotment details from the following article. The government of Andhra Pradesh School Education Department annually conducts the AP DEECET entrance test to offer admission in educational degree/diploma courses. CSE AP conducts various examinations such as Language Pandit Entrance for Telugu, Hindi, and Urdu, TTC, NMMS, NTSE, D.Ed, C.L.I Sc, Head Masters Accounts Test etc. aspirants seeking to get teacher jobs annually attempts various examinations conducted by CSE Andhra Pradesh. The CSE AP yearly conducts the Diploma in Elementary Education Common Entrance Test (DEECET) examination for aspirants seeking diploma in elementary education course. The AP DEECET is also known as AP DIETCET. Candidates clearing this test with good merit will get admission in 2-year Diploma in Elementary Education course in Private and Government District Institutes of Educational Training in Andhra Pradesh. Yearly, many of the hopefuls compete for this examination to get admission in D.Ei.Ed courses. The AP DEECET was successfully completed on 17th and 18th May in many examination centers of Andhra Pradesh state. Date of Exam 17th, 18th May 2018. Phase II AP DEECET 2nd Phase Counselling 13.08.2018 to 17.08.2018. On the homepage, admission latter link will be displayed. Enter the required details such as register number, name etc. The admission letter/allotment letter will be downloaded. Online payment fees ap deecet website lo epudu enduku echaru friends? Pls reply friends????? ?